Home » What Should You Say to The Insurance Company After an Accident? Your insurance company needs to collect details from you after a serious accident to process the claim, but it’s not a good idea to provide more information than necessary. If you recently sustained injuries in an accident, it’s natural to want to reasonably participate in the legal and insurance claim process. Sharing information about your claim may be your first instinct if an insurance adjuster has reached out to you to get further information about your claim. However, don’t provide more information than necessary to the insurance adjuster or you could be exposing yourself to major risks. For this reason, you need to an experienced personal injury law firm like Pepper Odom to protect you before you say anything or sign any releases coming from the insurance company. You might think that you are doing yourself a favor by protecting yourself in this way. However, you are actually only making it easier for the insurance adjuster to take your words and tweak them. They will make it seem as though you are not being upfront or you have some responsibility for the accident. The right Lawyer can help you navigate this complex process by assisting you with avoiding making any statements or signing any releases that would give up your rights. The right Lawyer can stop the insurance company from delaying or denying your claim. Only your injury Attorney is interested in protecting your rights in the event of an accident. Share all of the information upfront with your experienced personal injury Lawyer. Provide as little details as possible while still complying with the insurance adjuster’s request if you are contacted by an insurance adjuster after an accident. The right Lawyer will serve as your go-between with the insurance company. Therefor, you have a reduced likelihood of making any comments that could be misinterpreted. If the insurance adjuster continues to reach out to you, tell them you have a Lawyer and contact the Attorney instead. 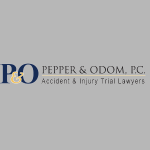 To learn more about Pepper & Odom Injury Lawyers, visit our home page.